In addition, this version comes with a black polyurethane (PU) faux leather cover, whose gorgeous design has been inspired by race car seats. All Nitro Concepts chair series from the Carbon Class feature a PVC back side covering with an eponymous carbon look. 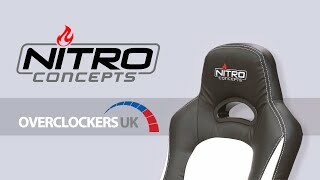 The whole package is being completed by subtle orange seams and a Nitro Concepts logo that adorns the headrest. As an added bonus, a little metal plate with logo lettering is included with every unit to allow you to proudly proclaim your ownership of a Nitro Concepts gaming chair. More links for "C80 Pure Series Gaming Chair - Black/Orange"